Today’s review is the next post in my series about removing plastics from my kitchen. This is not a sponsored post, but any Amazon links below are referral links as I’m an Amazon affiliate. If you make a purchase through any of my Amazon links, I’ll receive a nominal credit toward my own Amazon purchases. The Planet Wise reusable zipper sandwich bag is made with food-safe EVA; it is free of PVC, BPA, phthalate, latex and lead. EVA stands for Ethylene Vinyl Acetate. I was hesitant to buy this reusable bag at first, but I decided as long as I handwash this bag and since I’m not using it for liquids, it meets my requirements. I like this Planet Wise bag because the zipper keeps all the food in the bag (hello, grapes), and sandwich bread doesn’t dry out. My son LOVES the camouflage pattern. I still want to think of him as a little preschooler who likes cute owls and smiley faces, but the reality is he’s in elementary school, and he likes trucks and Soldiers. Besides grapes, we’ve used this reusable bag for sandwiches and tortilla chips. I’ve been washing it by hand, but it is dishwasher safe. I am careful to make sure the bag is open wide when I put it on the dish rack to dry. I don’t want any mold.It’s come in so handy that I’m going to buy another one or two! If you’re interested in other reusable lunch products, please visit my post on the Stasher, a reusable silicone bag. 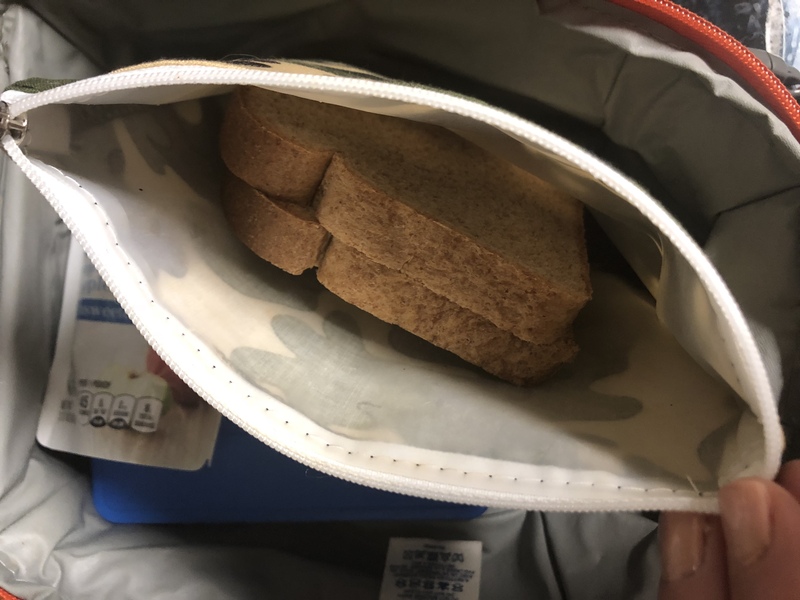 Do you use reusable sandwich bags? If so, what’s your favorite brand? I’m working on reducing the amount of plastic we use in our kitchen. I’m particularly concerned with using plastic free school lunch containers, so I bought a silicone storage bag to review. If you’d like to know more about why, please visit my previous post about this. 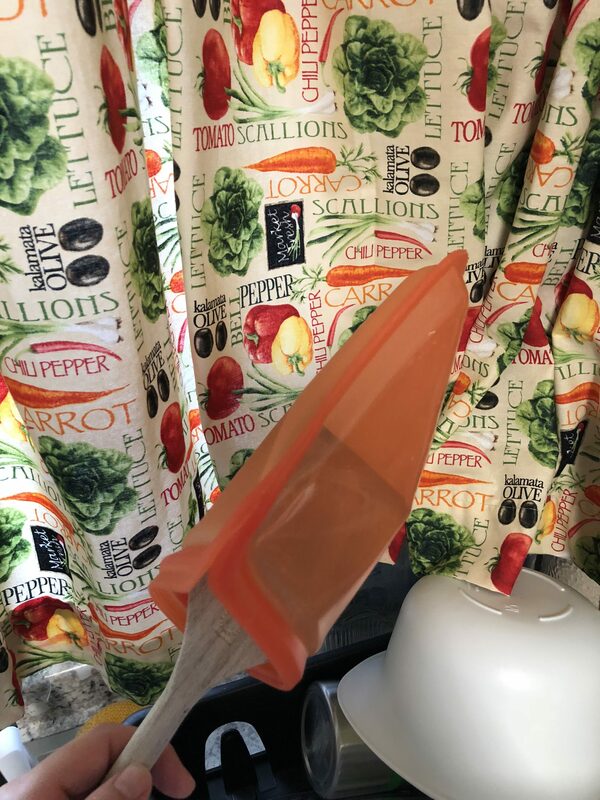 Today I’m reviewing a reusable, microwavable silicone bag called the Stasher. This is not a sponsored post, but any Amazon links below are referral links since I’m an Amazon affiliate. The research out there indicates that silicone is safer than plastic, and specifically, it’s heat-safe. One negative is that it CAN hold onto odors. I wash our silicone containers, plates and bowls with unscented dish detergent. That seems to do the trick so far, but we’ve only been using these containers and dishes for a couple of months. A web search will show you that there are tons of blog posts dealing with removing the smell from silicone. I guess that’s good and bad. Good because people have solutions; bad because it must be a common problem! Some people use baking soda or vinegar. Others have success just putting the silicone in their ovens for 15 minutes or so there are different things you can try if you’ve discovered your silicone is starting to smell. The Stasher bag currently comes in a snack size, a sandwich size, and a half-gallon size. They’re not cheap. It’s $11.99 for a sandwich bag, but you can use it over and over indefinitely, so eventually it pays for itself since I’m not buying plastic throwaway sandwich bags anymore. Our Stasher filled with grapes. The green container is a Lifefactory glass container…review coming soon! One, silicone needs to be 100% food-grade silicone without fillers; otherwise the silicone could contain plastic fillers, the one thing I’m trying to avoid in the first place. There are nearly a thousand reviews on Amazon of people using Stasher, and many of the reviews mention doing a “pinch” test on the silicone, and that Stasher passes. Now, I don’t know that the “pinch” test is entirely scientific. Basically, you pinch the silicone, or bend and squeeze it, if you see white, then the silicone has fillers in it. But even if it’s not a scientific test, the Stasher is sold at Crate & Barrel, the Container Store, Bed Bath and Beyond, Bloomingdales, etc. It’s been reviewed by the Washington Post, Good Housekeeping, the Food Network, and so many more. Because of this, I do have faith this is quality silicone. Two, the Stasher closes differently than most other silicone bags out there, and it’s easy for my 6 year old to manage. It’s a little difficult to explain, but if you look around at silicone bags on Amazon, you’ll see that most of them have a plastic stick-looking thing that slides over the top of the bag to seal it. I read reviews saying that type of top was tricky for kids to handle on their own, so these kinds of bags may be better suited for food storage in the home than a school lunch container. The Stasher closes almost like a throwaway plastic sandwich bag. It’s pinch-lock seal, and my son can open it and close it on his own. We use the Stasher to send sandwiches and burritos to school. Occasionally I’ll put something like grapes in it. Since many people use Stasher for sous vide, I could probably put things like mac ‘n cheese in it, but I haven’t tried that yet. The Stasher is microwavable. I explained to my son that first he needs to make sure the bag is opened to allow steam to release, but then he or his teacher can put it in the microwave. 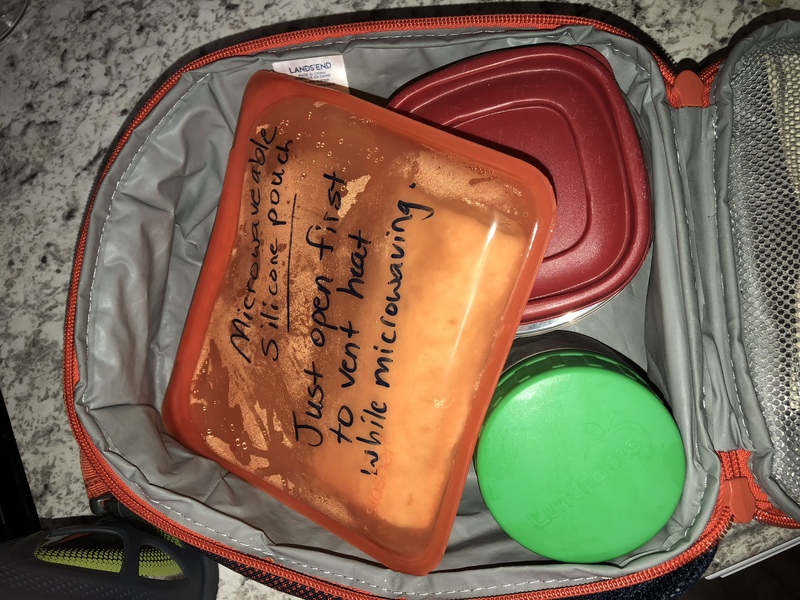 The first few times he used it at school, I wrote on it with a dry-erase marker, so his teacher would know that it’s microwavable. I also emailed her about it. 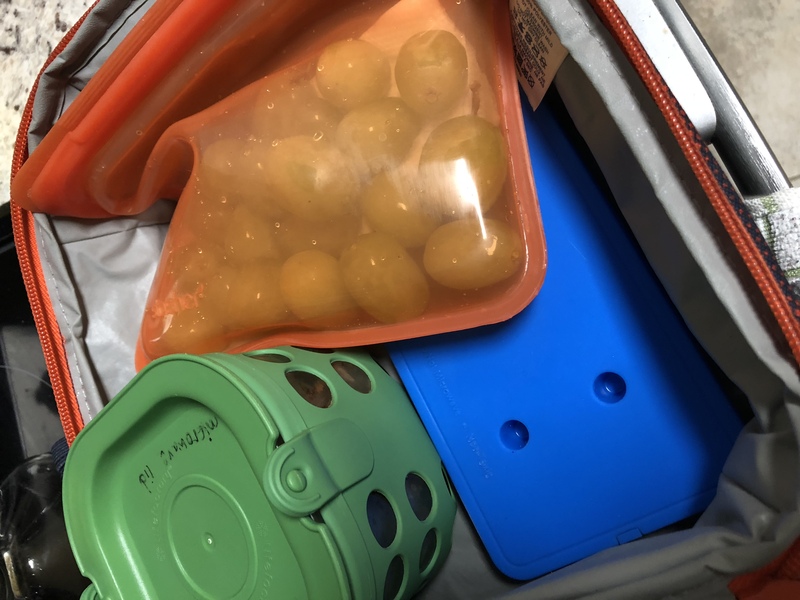 We’ve had no issues using the Stasher as a plastic-free school lunch container for us. Our Stasher with a burrito inside. The green container is a stainless steel container by LunchBots. I’ll be reviewing that one too. I usually wash the Stasher by hand with unscented dish soap, but it can go through the dishwasher. When my son comes home from school, I immediately rinse the Stasher even if I don’t wash it right away. I think that probably helps keep the silicone from picking up a food scent. For drying it, I use a spatula to hold the Stasher open to air out, and then I place it upside down overnight in a sink drying rack. I read a review online about a Stasher growing mold inside, but I think as long as you keep it open when it’s wet, that’s not going to happen. I use a wood or silicone spatula (nothing sharp) to hold open the Stasher while it air drys. So yeah! We like the Stasher! It’s also available in different colors and patterns, so that’s fun too! As I said up top, this review is completely independent. I did a lot of online research myself, scrolling through product reviews before I ended up purchasing this item at full price. I recommend this product, but that’s just my opinion, and you may find that this product doesn’t work well for your family. Also, the Amazon links are referral links. That means if you purchase anything through the links, I’ll receive a small amount of money from Amazon. When that happens, I save it all up until I have enough to buy…well, things like silicone bags and glass food containers to review! Do you use silicone in your kitchen? Do you have any plastic-free products you really love and want to share with us? This school year we’ve started using plastic-free school lunch containers. On Fridays, Little J gets pizza from the school, but other than that, he takes a lunch to school every day. I had been sending food in BPA-free plastic containers to be heated in the microwave in the lunchroom, but this summer the American Academy of Pediatrics recommended parents stop microwaving and dishwashing plastic containers including BPA-free plastic containers. The concern is that heating plastics increases the chance of dangerous chemicals leaching into food. The recommendation also covered food additives, but you can read it for yourself here. After reading that, I decided I needed to avoid plastics touching Jeremiah’s food as much as possible. Unless I start growing my own crops, I don’t know how I can possibly complete avoid plastics (just look around the grocery store), but I’m reducing our use as much as possible, and I’m definitely avoiding heating his food in plastic containers and avoiding putting his food in plastic containers that have gone through the dishwasher. I did some research online, and when replacing plastic, most people turn to silicone, glass or stainless steel, so this is where I also focused my attention. I was going to write one post with all of the products we use, but I decided it would be an insanely long post, so I’m going to write and release them one at a time. There are many more products out there (please share them in the comments! ), but the products listed below are the ones we’ve used. Please note that I paid for all of these products myself. The reviews I’m going to post are not sponsored. *The inside of the Planet Wise bag does have EVA on the inside; read my review for more information on this. Do you use any non-plastic food containers for your children’s lunches? If so, what do you use? How do you like it?